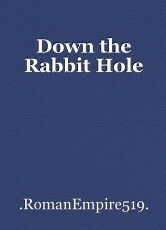 Down the Rabbit Hole, short story by .RomanEmpire519. The dark liquid is dripping off the rim of his helmet. Whose helmet? Don’t know. Where is he? Not sure. If anything, probably in No Man’s Land. A place where bodies can go to lie still on the ground; a haven where souls can finally break free of this everlasting hell; a trashcan in which a boy throws out all of his sister’s fragmented Dutch dolls. Whether it be a mindless act of revenge or an attempt to drive the agitating boredom out of his childish mind, the damages are irreversible. Now, the toys are way too broken. Completely unfixable. Within these foggy trenches, it’s hard to spot a man in need; it’s hard to find anything when you can’t even find yourself. As the helmet counts off the man’s last breaths, I sit on the soggy ground, thinking. Thinking about where that kid with his dreams had gone. Thinking about where he had gotten lost. Thinking. Next to me, the helmet slows down its counting. Almost dead. Soon, like frail branches in a fireplace, the fierce flamethrowers will devour the man’s body, or maybe, the avid artillery will instead sink onto and snap him into bits and pieces. Simply child’s play. What even is flesh to metal? Oh, my my, speak of the devil. Here come some more wild wasps. My head won’t stop ticking! These roaring booms and bangs keep stinging my head, my sanity. Oh Lord, I beg you, get them out. Out, away I say, you fiends! Shh, no matter, no matter Georgie. Remember what your papa said? To fight, to fight with the American pride that’s within you. Yes(! ), that beautiful, shining American pride. Armor that when worn shields you from any lingering fear. Yet, right now, I can’t find any of it. I am searching and searching but finding nothing. Nothing but a hollow me. I feel like an empty treasure chest, void of any gold coins. To what value am I even worth now if I have no reason to fight? If I have no reason to hand over my life? These pirates have no use of me no more. Pirates who have promised me money and satisfaction for my duty but have instead stole from me my friends, my family, my future. Now that I’ll die here, it’ll all be gone. Gone and out of my grasp. Gone and in their hands. The blood stops dripping; the rifleman ends his firing; the bombs quit their pounding and the bullets cease their flying. What could this be? Hold on, what’s that? The rifleman had muttered something, but I can’t hear from all this ticking. “The enemy is set to charge!” , this is it! My time has finally come. That kid with all his dreams and desires will now be lost forever. Never found. I gradually raise my head over the seeping, muddy wall, expecting to see death, expecting to see slaughter, expecting to see… Alice?! Yes! Indeed, that’s Alice jumping out of a burning fighter plane and floating down onto the battlefield. What’s this? Tweedledee and Tweedledum on a German tank? Oh my, there’s the Knave of Hearts spraying down men with a machine gun. Even the Mad Hatter is here! Though, it is quite difficult to see his face with that gas mask on. No, this can’t be happening. How?! I sit down and try to think this over. I try to understand, but I just can’t. I just can’t comprehend the incomprehensible; I just can’t think with all this ticking. I look up and see the White Rabbit staring at me. There he is in a red suit, black bowtie, a ticking gold pocket watch hanging from the top-left pocket, and a square camera in his hands. There he is with a blank rabbit face. A face too expressionless to have experienced any of this. A face way too sane. Honestly, it’s kind of funny. It’s funny how this unaware soul is meant to portray this catastrophe; funny how unlike everyone else here, he gets to come home all in one piece. Way too funny. Actually, it’s so funny that I just can’t stop laughing. I can’t! I laugh as my helmet starts to tilt from all the bouncing; I laugh as the screaming and killing are occurring nearby; I laugh as he aims the camera at me. I laugh. © Copyright 2019 .RomanEmpire519.. All rights reserved. Wow. This is such a good piece of writing. The terror of war, the dread, and then the images that come flooding in. Faultless!